When Lizzie's dad refuses to fight in the Second World War, the police come looking to arrest him. Desperate to stay together, Lizzie and her brother Freddie go on the run with him, hiding from the police in idyllic Whiteway. But when their past catches up with them, they're forced to leave and it becomes difficult to stay together as a family. 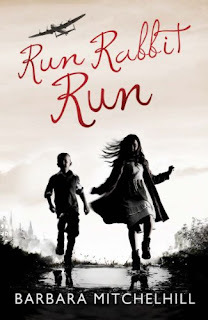 Run Rabbit run is a wonderful little book about a conscientious objector during World War Two and his family who are on the run from the police. It is told from the point of view of Lizzie the young girl of the family. With my teaching head on I thought this would be a fab book to give youngsters an insight into life during World War Two and the issue of conscientious objectors which is something I haven't seen done before in a YA novel. I enjoyed the story itself. It went along quite nicely with several little twists and turns put in. The family initially run away to Whiteway an estate within a village where the old man living there hides refugees and "conchies". As the story goes on main characters have to go on the run from their planned safe haven. The characters you meet within the book were written really well. I loved the family and seeing how they stuck together to deal with all the problems they came up against and enjoyed all the other characters they met whether they be nice or nasty. All in all a fab little book that gives a brilliant insight into life during the blitz. A must read if you are studying the period or if you loved books like Carrie's war or goodnight Mr Tom.